Ideal for one or two people and stays may be booked by the week or for just a few days, according to the season. 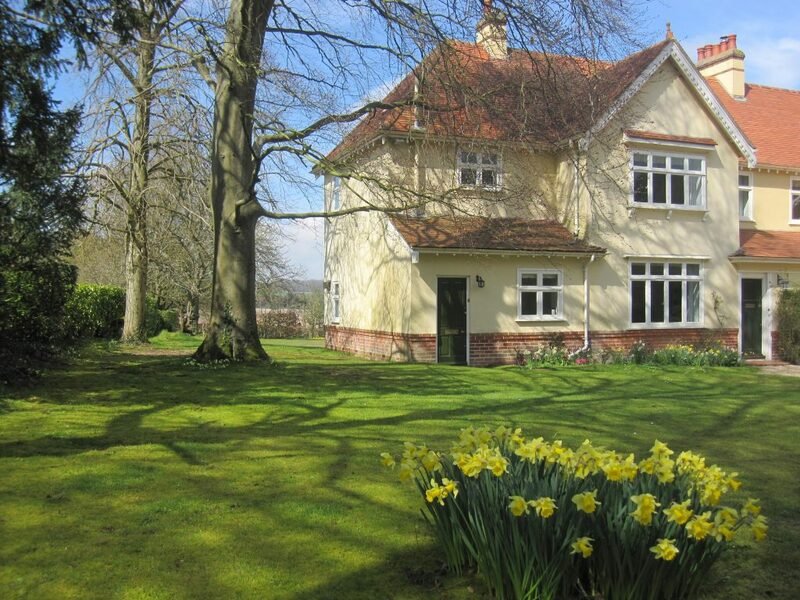 The Annexe is well placed for touring the attractive Hampshire countryside, towns and villages. Access from the A34 and M3 is quick and easy. The railway station (1 hour from London Waterloo) and the city centre are about two miles away with good local bus and taxi services. Within walking distance are take-aways, a café, a restaurant, supermarkets, a petrol station / garage, a doctors’ surgery and a chemist. The Annexe has a well equipped kitchen and a cosy sitting / dining room with Freeview TV and a DVD player. There is also a downstairs loo and a stair lift. Outside there is ample parking and a secure garage for cycles if required. Visitors are welcome to enjoy the 1½ acre garden. Upstairs, the bedroom has twin 3′ x 6’ 6” beds that can be zipped and linked to make a large double bed. The room is very spacious and well furnished. With windows on opposite sides, the room is light and airy and has delightful views of the garden and the fields beyond. The adjoining bathroom has a large bath and a large shower cubicle. Linen, towels and starter breakfast ingredients are provided on arrival. There is free WiFi broadband access. Non-smokers only please and with regret pets are not accepted. By road: From M3 junction 9 follow A34 (Midlands/Newbury) for 3 miles. Take exit for Salisbury (A272). Take 2nd exit at roundabout onto Andover Road North (B3420). After 1 mile turn right into Harestock Road. After 0.6 mile, The Down House is the first house on the right beyond Kennel Lane and a field. From the North on A34 take exit for Winchester (B3420) and take 2nd exit at roundabout then as above. From Stockbridge take B3049. On reaching the ‘City of Winchester’ and ’40 mph’ signs, Harestock Road is the the 2nd turning on the left. The Down House is 300 yards on the left beyond a field. By public transport: from Winchester Railway Station and the city centre, take the Stagecoach service No. 3 to Amport Close, Bradley Road, Harestock. Three minute walk via a passageway at end of Amport Close through to Rewlands Drive and, after turning left and walking 50 yards, a second passageway on the right through to Harestock Road emerging directly opposite The Down House.